When the devastating earthquake and tsunami hit Japan last year, it created more than 22 million tons of debris—the size of California, pretty much. Included in that debris was this ghost ship, a 150-foot long squid-fishing boat that's just been found, a year after the tsunami, near the coast of Canada. 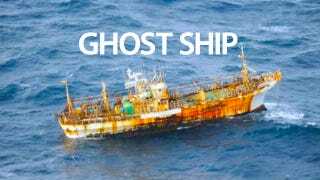 Spotted by aircrafts some 120 miles off the coast of Canada, the Japanese squid-fishing boat is a true ghost ship—no one is in control and no one is on board. The ship's owner confirmed it to be from Japan and told Canadian authorities that the ship has been lost since the tsunami. What's both impressive and a bit paranormally eerie is that the ghost ship managed to survive the entire year and nearly 5,000 miles in travel while staying intact. The ship is obviously pretty beat up, Mother Nature will tend to do that, but it's still upright and headed towards Canada as we speak. The ghost ship marks the first large sign of debris from post-tsunami Japan. Previously Japanese bottles and other knick knacks have reached North America's shore but with officials estimating nearly two million tons of debris to survive the entire trek across the ocean, it won't be at all surprising to see other items pop up in North America. In fact, officials are fully expecting to find more ghost ships like this too.